The new math – IPCC version | Wott's Up With That? “The new math – IPCC version“. Yet another copy-and-paste job from Anthony Watts. This time its an anonymous analysis from a sites.google.com page. 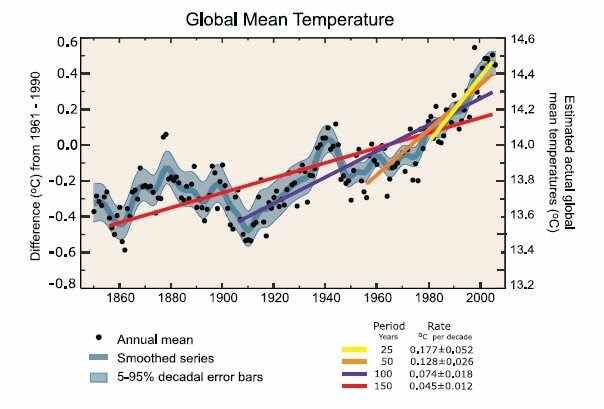 Wisely detaching themselves from their argument, they chose to confuse real-world temperature trends with synthetic sinusoidal data and declare that the IPCC’s Fourth Assessment Report is a lie(!!!!!!) because the synthetic trend changes with the number of cycles that are included. If you measure over different distances, you get different slopes! Wow. Well, duh. Of course it’s comical to suggest that the real-world temperature trends are better represented by a synthetic waveform. Where are the sine waves??? Let us know when you get out of high school, anonymous! This entry was posted in Anti-Science, Numbers are Tricky and tagged Chart cheating by Ben. Bookmark the permalink. Show all the 5-year intervals, not just the most recent one. 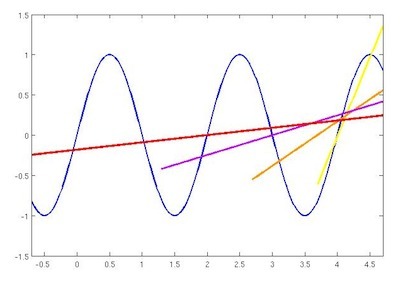 That blows away the sine curve idea.